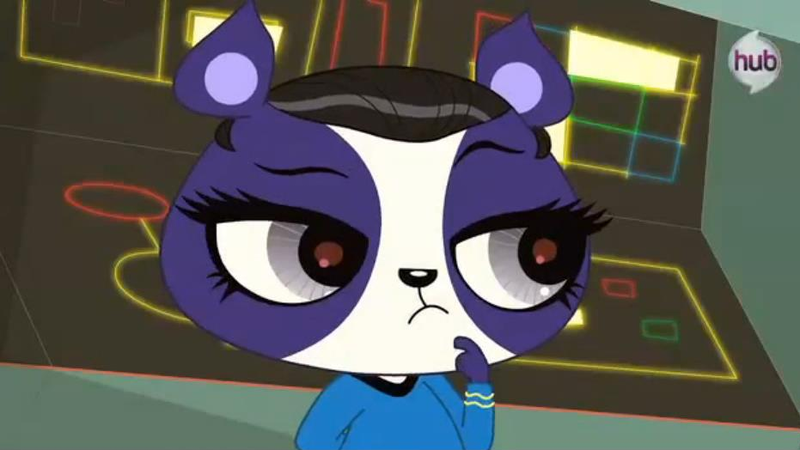 On an all new episode of "Littlest Pet Shop", Penny-Ling-Spock is not impressed. Episode 16 airs at 11:30am ET / 8:30am PT! For you bronies, last week's episode of LPS, "Topped with Buttercream", will air between the new "My Little Pony" episode at 10:30am ET / 7:30am PT and Episode 16 of LPS. Penny Ling is not amused. Is that what she was? I didn't really get her deal. She mostly was just Captain Obvious of every situation. That cat is so smooth. She's like Spitfire on codeine. But a cat. Well a hillarous episode. It is hard to really get into it that much after "Magical Mystery Cure" but I will try, well I thought the first time the truck went out of control was hillarous. And we got a Star Trek reference. How cool is that? I do wonder where did Suger Sprinkles, is she anyone's pet or she is stray that lives in the sweets truck? I guess we may never know. I am disappointed in Roger, he would think Blythe would go on a joy ride, he should know his daughter better than that. Though the irony in the end with Roger taking Blythe in the truck incident, and that ilittle girl's bike, poor little girl. One other question, this episode imply Youngmee lives with her aunt. I thought she just lived nearby and worked for her, but looks like Youngmee has no parents. I thought Blythe with no mom was something, but Youngmee has no parents at all it seems. I thought that Roger would be inpressed of Blythe's Happy Wheel skill ( when the pets actually made the truck move ) but I digress. Oh well....still amazing episode....and kinda referencing Kid vs Kat. Sorry but this seems like a copy of EQD. I know, lol just ignore that comment.